Somethings just get better with age, make sure your birthday parties are no exception. 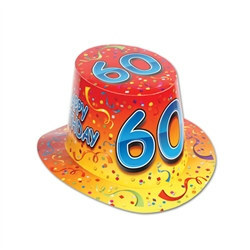 Crank up the fun and energy at your 60th birthday with these Orange Happy 60 Birthday Hi-Hats. The Orange Happy 60 Birthday Hi-Hats are the ultimate way to get your guests involved in the party festivities. Nobody will look out of place when you have one for everyone! Each hat has an inside circumference of 22 inches that will fit most party goers. Make sure to pick up Happy 60th Birthday Beads of Expression and 60th Hanging Cascade Columns as well.